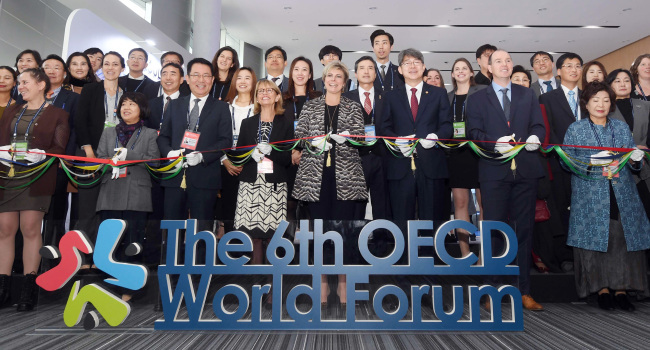 An Organization for Economic Cooperation and Development global forum on well-being closed in South Korea on Thursday, with the Incheon Declaration adopted to renew its commitment toward better quality of life. During the three-day run, some 3,000 leaders, experts and civic activists from 100 countries attended the OECD World Forum on Statistics, Knowledge and Policy. Under the theme of "The Future of Well-being," participants discussed people's well-being and inclusive growth as the ultimate focus for policies and collective action. They moreover exchanged views on what measures and actions are needed to foster well-being and on the new modes of governance that are needed to ensure inclusive growth and sustainable well-being in the coming years. Experts also discussed opportunities and challenges presented by "digital transformation" trends. The Incheon Declaration stresses that top policy priority should be placed on creating a virtuous cycle of improved quality of life leading to sustainable economic growth. The declaration also calls on governments, companies, civic groups and interested parties to make efforts to improve quality of life across the board.